*So far, I've not experienced this issue, but many TinkerTry visitors have. Details of the ongoing investigation will be added below. It appears mostly folks upgrading to 6.5 encounter this issue, but there is now a report of a fresh install experiencing this too, and Intel Avoton C2758, and an older Intel NUC. Anthony's quick fix seems to resolve all situations. Please leave a comment and share your experiences with us. The more details, the better! There's the symptom, only one SATA3/AHCI port seen by ESXi 6.5's slow default driver. C'mon VMware/Intel, really? NOTE: The M.2 NVMe 950 PRO by Samsung is apparently not affected, tested it myself. There are questions about the Samsung SM951, so I'm working on verifying that little M.2 gumstick SSD next. Highly likely this fix applies to other Xeon D systems as well. 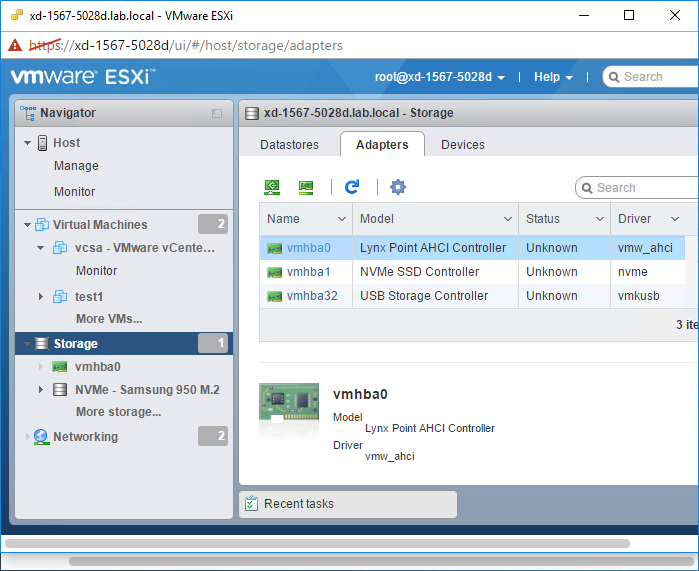 Have a look at the (early days/growing) ESXi 6.5 VMware Compatibility Guide for Xeon D here, and the much larger 6.0U2 list here. Of course, it's expected that all Xeon D systems that Supermicro makes will be on the 6.0U2 (and now 6.5) soon, as explained by Supermicro during my visit to their VMworld 2016 US booth. Yep, that simple, a one-line fix/reboot, and you're back to full speed ahead. Like Anthony, I'm proud to be also be a Veeam Vanguard, an amazing group that regularly gives back to the broader virtualization community. I really appreciate his helping out his fellow Xeon D owners like this! I frankly don't recall coming across any of this strangeness during my fairly extensive beta testing. 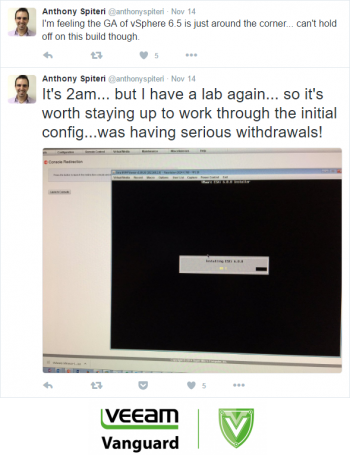 Kinda strange that VMware would do this to their partners, I'm sure there was a reason? Once validated/reproduced, I'll work on getting this reported to VMware in some official way without having to open a $299 ticket. Ideally, squaring this away before their next 6.5.x release, see also VMware's colorful history, as told by homelaber Florian Grehl. Next up, testing out the 10GbE support for the Intel X552/X557 10GbE chipset that's on these systems. Tried to get that baked right into 6.5, and likely future releases will have it included. Meanwhile, also a very quick fix, with no reboot required. Pictured at left, NVMe, at right, SATA3 SSD. Click to view larger, again to view native resolution, using arrow keys to easily compare. 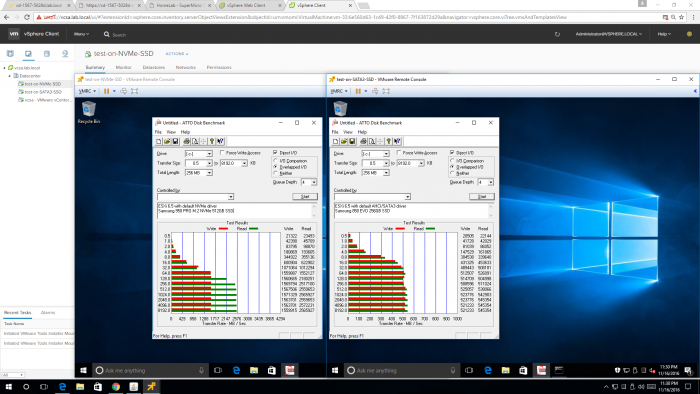 Both the Intel Lynx Point Series Chipset driver and the native VMware device driver were loaded, but unlike Anthony's experience, this didn't seem to cause any performance issues on my systems. Here I demonstrate my first attempt to replicate Anthony's findings. 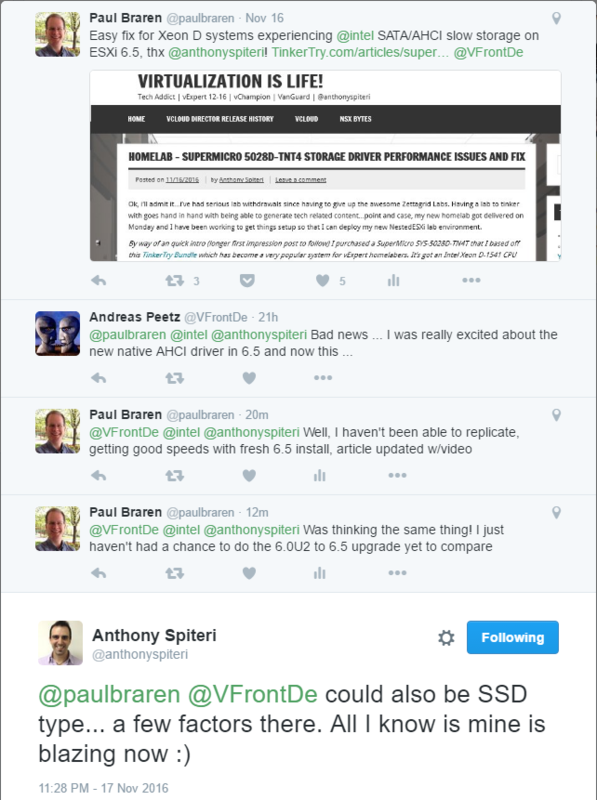 Preliminarily, it appears that this issue affects folks who upgraded from ESXi 6.0U2 to 6.5. So we might be all set here, folks seeing the slow-down do Anthony's fix, then they're all set.